Safety at the workplace is crucial to the success of every undertaking regardless of one’s profession. Coveralls in this regard form a significant part of the safety equation because they are some of the most popular work garments. They are usually worn over ordinary clothes or purely as work uniforms but plays a more vital role in protecting workers from harmful substances, dirt or stains among other things. Shopping for coveralls might not be a walk in the park as many may think and more especially for first-timers. It takes more than just identifying your preferred brand and placing the order. Protective clothing is quite different from your day-to-day wears which in most cases take into account fashion and style only. You need to have a deep understanding of the nature of work you are bound to involve the Coverall and as such take into consideration several factors before purchasing the best suited for your job. If you are one of those in search of the best coveralls for various tasks, hopefully, the list below will be of help. However, before that, have a look at some of the factors that should inform your choice depending on your needs. The degree of satisfaction afforded by a coverall has a close correlation with the performance levels of the wearer. While the primary purpose is to give protection, it makes no sense to buy something that makes you restless and constrained. Remember the job might require extended working hours or the environment may already be intimidating and donning a stuffy work wear only worsens the situation. Comfort is found in getting a piece that matches your size and with a construction that allows free and broader range of movement. The coverall should not compromise on mobility while going about your business otherwise productivity will also be limited. 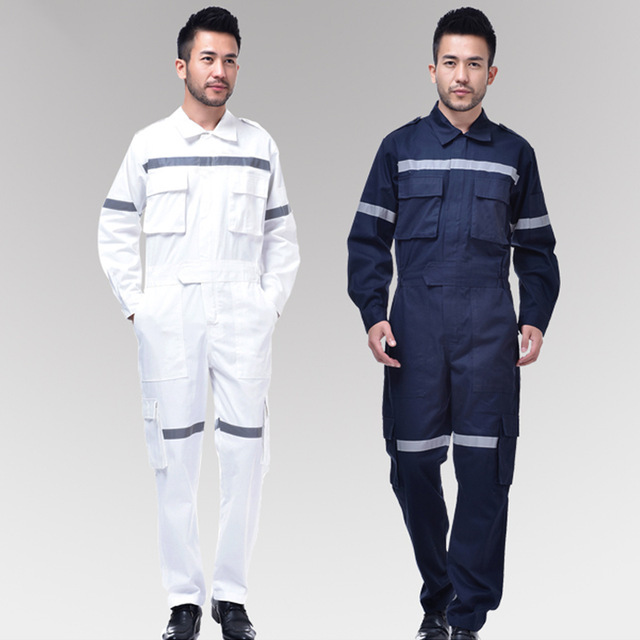 In short, a coverall should make your work easy and therefore it is necessary to choose carefully to get the best fit. The type of material used to manufacture a coverall to a large extent determines its suitability for particular work. As such, getting the right fabric is thus critical. Of course, there are several materials you can choose from including polyester, cotton, Silk, polyethylene and blended varieties just to mention. For a general purpose coverall, it’s advisable picking a versatile fabric that can rise to every task. Similarly, if your intended purpose is specialized, you will require a material that is tailored to your reality. For instance, you will need a garment that is insulating and breathable if you work in a hot environment. The same way anyone dealing with water or harmful substances such as lead necessitates fabric that is not porous. The material should not only guarantee maximum protection but should also be cozy and ideal for the work. Just like any other product you may buy as a consumer, the worth of a coverall will mostly appeal to you depending on how long you use it. Usually, this associated by purchasing costly products. However, the most important thing is to remain protected for a reasonable duration. At the same time, you don’t want something that fades and shrinks at first few washes just because it is cheap. Consequently, before placing your orders, some little research would offer better guidance on what will keep you off the shops for quite some time. Typically, a suitable design should reflect the work environment and equally stand compliant with the needs. That is to say, it should be tailor-made to the needs of the profession. For example, if you are working in a low light area, a coverall with high visibility features would be appropriate. The same way anyone handling fire or heated substance needs a design that is resilient to extreme heat. The unique engineering behind any fabric is critical whether you are dealing with lightweight or heavy-duty jobs. Moreover, it has a role in ensuring the cleaning and maintenance are equally easy and efficient. When the topic is all about protective work gears that matter, no doubt Dickies products will definitely make it to the list. The brand is a common name for many professionals whose line of duty necessitates protective clothing. The immense trust consumers have in the manufacturer clearly did not come easy. Through its reliable and equally functional products, there is enough to settle every working gear desire. When it comes to getting durable and comfortable coveralls, the brand's collection offers suitable alternatives depending on the nature work you intend to embark on. 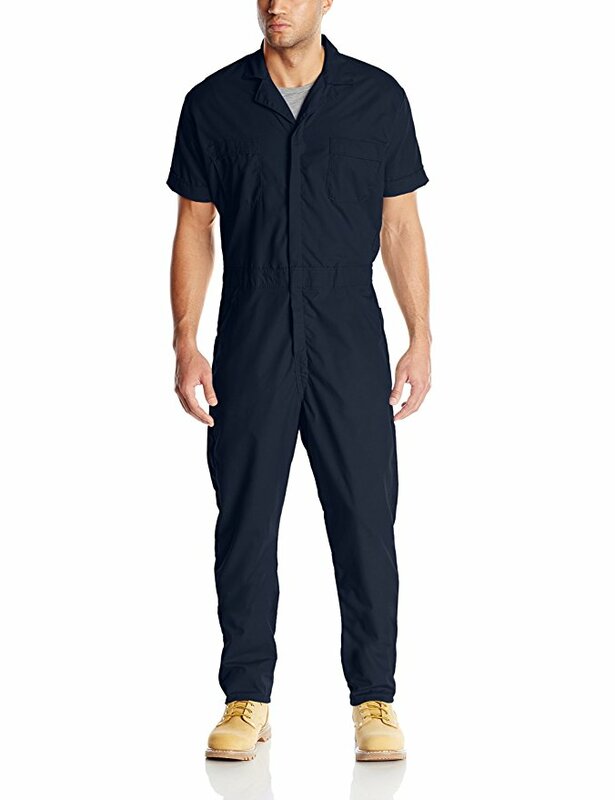 If you're seeking a new spin or just want to expand your working wardrobe, the Dickies Men's Basic coverall is a fantastic model you might want to try. For sure, it is an exceptional creation skillfully put together for use in the construction, industrial among other light and heavy duty jobs. 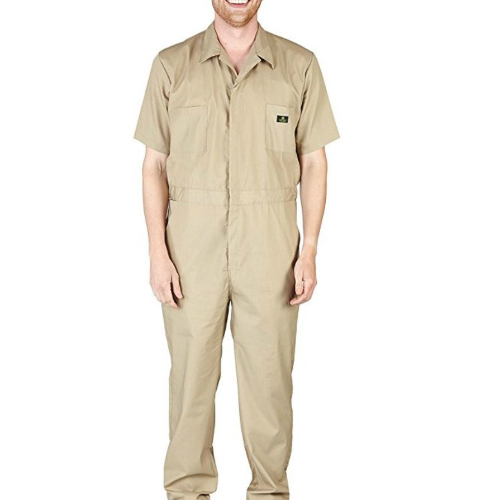 Made of sixty-five percent polyester and thirty-five percent cotton there is every reason to believe this coverall is of substantial quality. Its capacity to facilitate your work is evident through the superb bi-swing back and elastic waist which is both comfortable on the body and allows free movement at will. Even those with broad and "bulky" body frame will find a perfect fit without struggling. You will be happy that this coverall is lightweight and therefore won't slow you down with tools stuffed into the pockets. Speaking of pockets, it features snap closures and strategic pockets on the chest, sides, and the back where you can keep all your working equipment such as a ruler, pens and so on. The pockets can handle almost any relevant tool you may throw at it. Similarly, you will not be troubled with cleaning and maintenance because it is fade resistant, does not wrinkle, and comes with an easy care stain release finish arising from the blend of cotton and polyester. Besides you have the freedom to wash it by hand or the machine because either way poses no danger of jeopardizing its quality. With a soft padded lining and wind resistant nature, you will be safe even without a pant worn inside. At no point will you be disappointed because this coverall comes with heavy duty brass two-way zippers to allow easy use. It is indeed a good fit for outdoor work because every detail is designed to last even under very harsh conditions. In essence, it is suitable for any trade without much restriction. The Dickies is an ideal workplace classic. With all the incredible features that maximize user satisfaction, the pricing is nothing short of value for money. You will be surprised why you did not get it earlier on because your performance going forward will improve. Performing any job outside the regular white-collar jobs comes with a lot of uncertainty specifically in regards to safety. As a result, it becomes reasonable and prudent to have protective clothing help you sail through the tides of high-stress endeavors. While the responsibility of ensuring you remain protected on the job lies on your shoulders, the availability of reliable workwear rest squarely on manufacturers determined to guarantee consumer safety through top quality products. Over the years the DuPont brand has always taken the role of engineers, emergency response units, lab technicians, industrial workers, DIY guys, construction workers, farmers among other professionals seriously. Through innovation, DuPont has turned out to be a world leader in the art of manufacturing tested and proven quality protective clothing. Every coverall produced by DuPont reveals its desire to shield. Specifically, DuPont's TY122S disposable model redefines what a workwear should be like in the face of increased risks at workplaces. The abundance of important talking points on this coverall gives enough insight why you should check it out. Providing unprecedented levels of safety the TY122S is suitable for those working on or with hazardous materials and skin irritants including fiberglass, mold, asbestos, lead, paint, and dust. The suit can also be used for a wide variety of roles such as costuming, cleaning, farm work, and general maintenance projects. 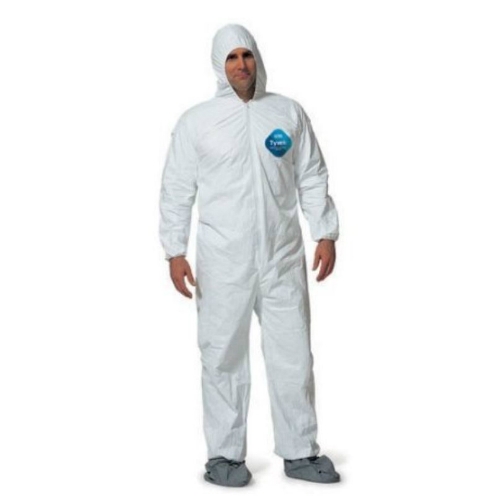 The coverall offers complete body coverage leaving only the face bearing in mind that it has an attached hood and booties. Its intrinsic barrier protection means that by adding on protective gloves and face mask, you will be ready to tackle any project without fear of mishaps. You will like the balance of comfort, protection, and suitability to a wide range of tasks afforded by this product. Its comfort fit design with elastic waist allows a broader range of motion while squatting, bending or walking. With the tear-prone spots having reinforcements to limit chances of blow outs, you can make the order depending on your body size. Moreover, it uses a long zipper line which enables the wearer to put it on or off. The preference for this suit is rightly so because the unique material is something you cannot easily come across. The fabric is soft thereby guarantees comfort. The manufacturer has it in mind that potential users are not made of inviolable material but are just human, and because not all threats come in the form of weapons, they can be prevented quite efficiently. You cannot get enough of this workwear because it is one of a kind as compared to ordinary disposable coveralls. With the DuPont TY122S, you will be able to stand up to any jobs and perform with confidence because its ability to shield you from spills, dirt or harmful exposures is impressive. Ideally, this coverall is specially packaged for convenience purposes, and it can't get any better considering it is available at a pocket-friendly price. When it seems impossible to get back to the house without stains and dirt, then you only have very few options left. You might think of practicing or exercising more restraint to achieve some level of tidiness, which of course may not be a walk in the park. The remaining reasonable step to take is getting an excellent coverall to help you swim through the murky waters of demanding outdoor works. If you are of those who have made up their minds, you do not have to look any further because here is a complete product that comes with great features necessary for light duty and heavy duty roles alike. The Natural Workwear coverall is manufactured from machine washable fabric that is 35 percent cotton and 65 percent polyester. Available in several shades including Navy, Royal, Black, and Khaki among other colours, the suit is a great pick as a casual wear, medical wear, and as workwear just to mention but a few. From every end, this coverall is a fantastic addition to any protective and working gear space taking into account the general construction and the quality of the material among other features. For instance, it comes as an easy to care for suit because it is resilient to stains and wrinkles. It means you will not have to go through trouble maintaining the fine and original state. Besides that, you won't have to waste time washing it by hand because you can quickly have it machine washed and dried before using it. Ideally, the blend (polyester and cotton) of material is responsible for the superb heavy duty finish that resists dirt, stains, and wrinkles and keeps it intact after a dozen of washes. Similarly, it comes with a flexible fit that maximizes comfort for every body size. The reliable bi-swing back feature and the stretchy waist with concealed snaps further gives room for flawless movement while at it. You have all the freedom to make every move as the work may dictate without feeling even the slightest restriction or discomfort. The attractive styling and consequent great look afforded by this piece will no doubt get your attention. The exceptional professional design will give you an extra edge over your workmates or better still endear you to the eyes of observers. At that point, you will be beaming with confidence and can go ahead and conquer the most grueling jobs. The coverall also comes with sufficient well-placed pockets. If you have been burning with desire to carry along important pocket fitting tool or devices such as a mobile phone, you will be sorted with this protective suit. Whether at the chest, back or the front the six pockets provide enough room for all you may want to carry around the working zone. Without any doubts, this coverall is real deal for any consumer seeking a complete cover garment to wear to different workplaces. You will be satisfied with the price range because it's in line with the performance levels you are promised to get. The durable and light weight fabric will ensure will ensure you get long periods of quality service. Among Red Kap’s purpose-built workwear, the Men's Speedsuit stands out as one designed artistically and with pride. It is an ideal protective garment for garage works, farming, workshop environment, and any other job that requires some physical effort. Crafted with 35% combed cotton and 65% polyester the coverall comes with a slim fit design that has the capacity to minimize sweating and keep user rejuvenated to perform. Its suitability to help you keep cool and dry is out of the question because the blend of material facilitates moisture retention in the body. The 5 oz. Poplin fabric boasts of a tried and tested technology that guarantees comfort even as you go about your work. And that's not all because it is fitted with action back pleats and side elastic bands which gives room for free movement and allows the flexibility for the required range of motion. The speedsuit unique engineering ensures consumers get not only a solid coloured material but also one with a stain resistance capability. You will be satisfied to know that you can quickly drop it the machine and have it cleaned up. Featuring the soil release technology, getting rid of grease, dirt, and stains is never an issue. Moreover, the material is wrinkle resistant. Therefore, you don't have to subject it to ironing after every wash. It's especially convenient if you do not want to spend much time on maintaining the fabric instead you can keep diving in without much ado and take care of tasks at hand. 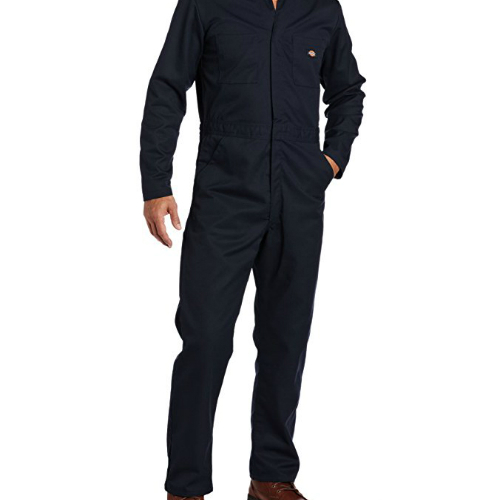 Similarly, this coverall comes with a two-way brass zipper that enables the wearer to make adjustments (putting on or off) and efficiently use the suit. Ideally, the zipper also allows access to the inner part of the coverall either from up or below without opening the entire outfit. Furthermore, it features a zero scratch technology stemming from snap closures over the zippers which help you avoid accidental scratching or damage on smooth surfaces you are working around. The coverall has sufficient storage space in the form of two pockets on the front, a pair on the chest, and other two hip patch pockets. It means you have no reason to leave any pocket fitting tool for your trade behind. And if you always want your phone nearby, the right chest pocket has a utility flap to help you keep it safe. The speedsuit being a short sleeve version is quite stylish and firm. With a one-piece topstitched collar and adjustable cuffs, you don't have to be told that this is one of a kind. Also, the main seams safety stitches give clear indication that the coverall is resilient enough to overcome any tear pressures at the edges. Coveralls don't have to be expensive to improve your daily working outcome. Red Kap Men's Speedsuit comes at an incredibly affordable price in comparison to the quality you get in the end. You can begin a new journey of comfortable working by getting this piece. It will help you remain active and on top of things no matter how daunting a task may appear to be at face value. Get dirty with this speedsuit, and you will never regret the decision. Out of experience, you may have realized that not every coverall available out there in the market comes with the levels of worth you would expect. And with an extensive pool to choose from, arriving at the right pick may be a daunting task especially for first-timers. All the same, the primary concern is to get a piece that blends well with your work environment and can serve relentlessly for several years to come. Walls coverall to this end comes as a real deal for multiple endeavors. Made of 100 percent cotton this protective garment features artistic twills that guarantee durability under any circumstance. Moreover, it boasts of the triple needle stitching that makes it practically impossible to tear at the joints. The quality cotton fabric that is both soft and flexible allows the wearer move with a significant degree of ease and certainty. No wonder the coverall is tactfully designed to ensure full body coverage for maximum protection. As such you do not have to shy away from accidental spills, dust or any other form of dirt. Similarly, it comes with a uniquely banded waist with elastic inserts and bi-swing back pleats that ideally show the manufacturers commitment to guarantee comfort. Its two-way front metal zipper with a classic snap-over fly is something you will love of this overall. As if that is not enough, it features two front zippered chest pockets, two rear pockets, and left sleeve pencil pocket. As a result, you have enough room to keep equipment or devices that can easily be misplaced while on your day to day errands. When it comes to care and maintenance, you have the freedom in your hands. You can opt for machine wash or hands wash as you may find fit. Purchasing this coverall for all your outdoor or indoor work means getting a relaxed fit and firm construction that facilitates your desire to work hassle-free. You will get impressed with the whole experience of wearing it. For anyone looking for an all rounded protective garment, the Walls coverall is highly recommended. It not only comes with lasting quality but it also offers a blend of fulfilling value and functionality. As opposed to the familiar Workwear brands you can quickly get (whether in shops or online platforms), this is more than just your normal protective clothing. It is indeed a tool in itself. At the price it is offered you can never be disappointed because it is a case of a viable investment. You will remain protected, comfortable and safe. While at most manual jobs, professionals and DIY guys find it reasonable if not compulsory to put on protective clothing. The big concern then becomes a perfect gear that supports the no-nonsense approach that most people adopt on almost every undertaking. Most of the time manufacturers promise a lot in regards to money's worth but that does not mean spending a few extra coins will guarantee a product that will make your working experience a little more relaxed or flawless. Of course, it's not much about what you are willing to spend but a constellation of factors. It takes more of a combination of features tailor-made to user standards. To this light, the Carhartt Big & Tall Flame-Resistant coverall stands out. As an inherent heavy-duty insulated coverall, it is designed and built for all the messy and cold outdoor work. Consequently, it suits areas such as construction, farm work, ranching, vehicle maintenance, industrial processing activities among other demanding day-to-day roles. If you have been part of the many suffering due the misery subjected to them by inefficient garments, this is the time to make a change. The overall is comfortable and easy to put on or take off with or without other clothing on the inside. Of interest to you will be the balanced and non-burdening proportions when it comes to the material weighting. The coverall features a heavy front brass zipper with a two-way mechanism that ensures ease of use. By zipping both ways, you will be able to access the inside pockets promptly while at work from either end. Furthermore, it also comes with snaps constructed on the lower ends that act as the leg openings to facilitate putting on or ejecting work boots. In reality, this is helpful when you want to quickly take off the garment for instance, when taking a break or when the heat is too much to bear, and you need to cool off a little. What is more is the flap and snap closure mechanism that provides the much-needed wind barrier and equally shields the zipper from any intrusion from substances such as mud, chippings or soil particles. When it comes to suitability for use, you will be happy to have an amazing spread collar, and two chest pockets complete with flaps, pass-through pockets and an extra utility pocket to help you carry your paraphernalia. 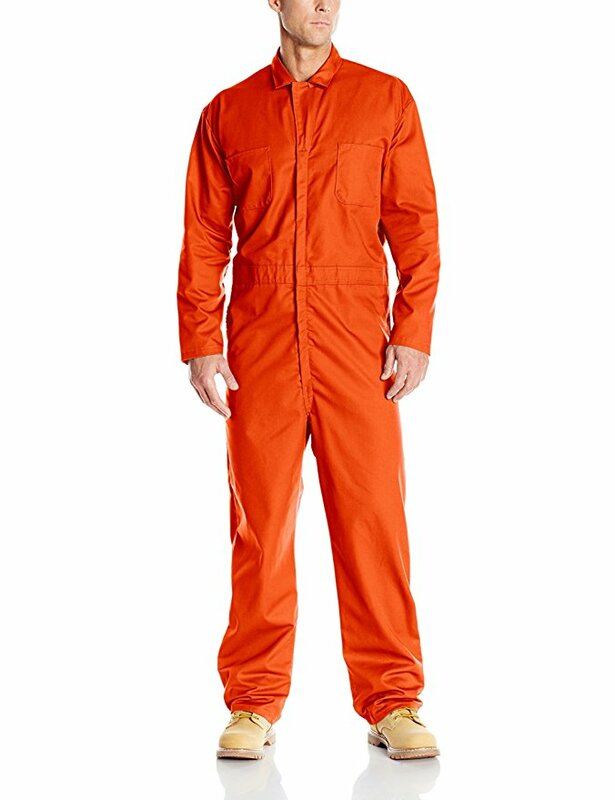 And with a pleated bi-swing back, split back construction, and main seams triple stitched there is no question of the safety, comfort, and durability of this work uniform. Being compliant with standards you have all the freedom when it comes to taking care it. It is both washable with a machine or by the hands. The Carhartt coverall to a great extent meets the merit of what a protective coverall should be to consumers. Made of 100 percent tightly woven cotton fabric, it is indeed manufactured to withstand wear and tear pressures while remaining gentle on the skin for maximum comfort. The pricing is no doubt value for money. If you have been looking for an economical way to protect yourself and feel great at the job, then your search might as well be over. Norty Men's Long Sleeve coverall offers the much-desired solution to almost every workwear need. With an incredible capacity to shield workers from potential hazards in addition to making the work environment less intimidating, this coverall is a must-have for those seeking to increase varieties in their protective clothing collection. The principle idea behind this Norty's creation is the needs to help all working in a casual environment (regardless of task) remain safe and sound. In essence, the product gets manufactured to assist users to feel on top things be it in construction, industrial, mechanical repairs among other demanding casual jobs, so they say. True to the manufacturer's assertion you will get a taste of splendour by purchasing this as your trusted work gear garment. It comes with wonderful features that are comfortable and lasting but is still conveniently affordable. This is a creation of 65 percent polyester and 35 percent cotton. In totality, it is tightly woven revealing neat twill that is both solid and wrinkle resistant. The garment is easily washable, and with its inherent stain release capability, you will be thrilled how efficient it is to maintain the coverall. It is also impressive that after long periods of sustained use and washing its colour remains intact because the material is fade proof. For comfort and freedom during use, it comes with a flexible waist and bi-swing back combination. You will be able to move, squat, kneel or even lie down to access the most isolated areas with this work garment hassle-free and without limitation. Similarly, it comes with spacious back pockets, neck pocket, handy ruler pocket, and double chest pockets suitable for embroidery to enhance individual taste and style even as you carry the essential tools. It is also lightweight but unrelentingly durable to allow extended use. Combined with the two way heavy duty brass front Zipper you will not be disappointed because the blend of features and creative construction will work in your favour at every job. As a result, your performance level is bound to improve at the acquisition of this Coverall. Above all, the fact that it is affordable makes it ideal for construction work, garbage collection, gardening, garage works among other outdoor chores. For an improved working experience, you can get this, and I bet you will fall for it at the first touch. Quite frankly the quality is up to standard, to say the least. The Red Kap brand is known to lend their expertise to workers of all kinds of jobs by crafting exceptional protective garments and uniforms. Every piece in their collection has always lived up to consumer expectations, and this one could be no different. For those who believe in getting to work with the right gear, the Red Kap Men's coverall will make you happy. It is created to assist you to push harder as the task gets more demanding and equally help you reach desirable heights no matter what it takes. Manufactured with a blend of 65 percent polyester and 35 percent cotton, this coverall comes as a comfortable and durable workwear meant to help users smoothly take on any challenges at work hassle-free. The summation of incredible features will enable you to run through day-to-day jobs feeling safe and confident. To begin with, the coverall is easy to clean and maintain. You have the latitude to do the washing by hand or go for the machine wash. I bet you will be moved by the pre-cure durable press finish with soil release which makes it slightly easy keep in order. Interestingly, the material also features superior colour retention ability hence does not fade quickly. If you are among the many who detest dull and faded clothing, be sure you won't have to face that in this case. Not before an extended period of usage. The 7.25 ounces Poplin fabric is artistically designed to afford you an adequate range of motion in line with the nature of most physical jobs. The sizing and fit are flexible enough to allow wearing over clothes. It implies that you can embark on any task quickly or as soon as you get called to action. Well, comfort is a notch higher in comparison to other ordinary alternatives. Through its pleated action back and stretchy waist, moving back and forth, bending or sitting will be smooth and easy. About in-built space to keep close all you need, thesuite comes with two front pockets, hip pockets on each side, two breast pockets, and ruler pocket on the right leg. Similarly, it features a strategically done side vents to help you access the interior especially when worn over clothes. Besides that, they also contribute to the ease of movement. You will be happy to discover the no scratch mechanism and full two-way zipper with snap up closures that enhance the ease of use while preventing accidental scratches while handling smooth surfaces such as paints. If you have been thinking about the kind of protective clothing to buy, the Red Kap work uniform can be a good pick. Offering a balance between design, comfort, durability, and affordability, this is no doubt a good bargain. With a little budget you can purchase the coverall and take on your next project full of confidence. The increasingly flooded market of protective clothing can be especially overwhelming for those who desire uniquely inspired creations. With very few options known to offer the cutting edge necessary for different jobs, getting the most appropriate fit can be outrightly confusing and soul-crushing. In most cases, very few brands offer the features most consumers are looking for in a coverall. Happily, the narrative is different with the Rothco Flight Coverall. At a time when picking the best air force inspired coverall requires time and energy to settle for the best, you will be impressed by this protective garment immediately you make a move to buy it. This is a new generation creation aesthetically put together to make every bit of your work less daunting. Whether your workplace is all about freewheeling, professional contractual projects or anything-goes spruce suiting, this can be a great addition to your working gear wardrobe. Worth noting is the fact that it is a civilian version of the elegant and famous flight suit used by elite Air Force units. That alone is a huge selling point you will be proud to mention to your colleagues at work. All the same, the flight suit gives the real feeling of flying at the job because you don't have to belong to the Forces or flight crew to have it on. 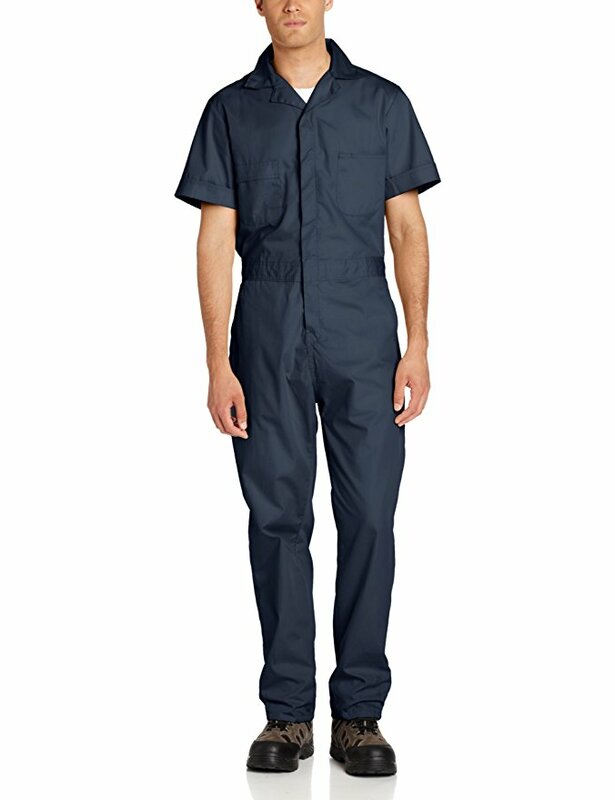 Made of 100 percent polyester fabric, very few coveralls comes with such an impressive level of quality. Rothco flight coverall features 2-way front zipper and pleated leg zippers that are compact and easy use. It also comes with adjustable waist cuff tabs complete with loop and hook closures that ensures optimal adjustments for comfort even as you move about your working space. The slash utility pockets come in handy to provide the much-needed storage space hence you do not have to worry losing touch with your pocket-size tools. Apart from the showy inspiration behind the creation, getting this will help protect your body and clothes from paint, oil, grease, dust and other forms of dirt associated with outdoor work. You can keep warm, tidy and neat from the inside such that once done with any piece of work none can notice once you take off the overall. Interestingly this coverall features a removable name tag holder that lets you display your name in the case of structured and formal work situation. The reinforced shoulders also come in to increase the enjoyment at every task. Rothco coverall is excellent for fun activities as well as for professional roles such as in workshops or garages. Providing safety and comfort, this protective garment is available in numerous sizes meaning there is something for everyone regardless of height and body frame. If you don't have such an extreme budget suitable for high-end coveralls, this Rothco Flight suit can be a fantastic addition to your protective wear collection. With it you will benefit from a quality fabric that allows you to do all the sitting, squatting, and quick movements without fear of the stitches giving in to the pressures. If you have been burning with desire for a high quality-jack of all trades protective workwear, then you seriously need to have a look at the Berne Men's Coverall. Made for those who want to get dirty at the job and still save their face, it offers the middle ground required by many to get going on all manner of work. The secret to its irresistible nature lies in the blend of striking features that are lacking in many brands out there. Combining versatility and comfort, this coverall at all times remain an excellent choice for a wide range of roles. The depth of quality in the 5.5 ounces, 35 percent cotton, and 65 percent polyester combination with soil release brings all the coziness you will need under extreme working conditions. With this coverall, you will be ready to conquer all that comes your way. The sturdy construction as supported by safety stitched seams and reinforced bartacks at all stress points guarantee unyielding performance whether on light-duty or high-pressure jobs. As far space to stash favourite stuff such as tools, pens, ruler or mobile phone is concerned, Berne coverall comes with abundant pockets including two on the chest. The right has a fantastic snap closure, and the left can act as a handy pencil slot just to mention. Adding to the count are two front swing pockets and another pair of hip pockets. The galore of features does not end there, from the standard edge-stitched collar and the four-needle stitching on waistband with elastic inserts to the ever-adored pleated bi-swing action back, the suitability of this coverall is evident for all to see. The lightweight but durable nature of the fabric adds on to the already impressive components. By the time you are fully geared up, you will get adequate body coverage without being weighed down. In the same light, the workwear also comes with a resilient two-way brass zipper that secures the coverage and keeps the fit. The zipper concealer slide helps keep it intact by preventing any external interaction (no scratch mechanism). Berne Men's coverall is a fantastic pick for the warm climate. As a creation from a manufacturer trusted over the years for its consistency in offering consumers quality workwear, you will find the price range very reasonable. 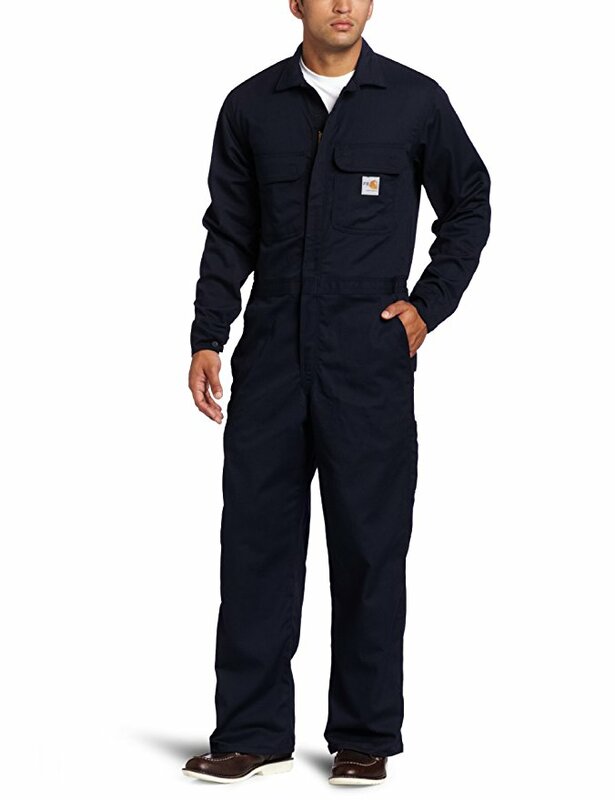 You will be ready for any task in this coverall because care and maintenance are equally less demanding. Q: What should I do to ensure the pick matches my size? A: To get the fitting match, you need to consider the dimensions stated by the manufacturer versus your height, waist, and chest measurements. Furthermore, you need to aware that different brands have their sizing either to the lower or upper margin. If you are not sure about all that, then go for a size larger than what you usually wear. It is better to have a sizeable piece than something that won’t fit at all. Q: What else should I know while using coveralls? A: Coveralls just like any other protective should be utilized according to manufacturer’s instructions. That way you will be sure the comfort and safety standards remain as intended. From storage to washing you should stick to the instructions because doing otherwise may jeopardize their quality and effectiveness. Q: Can coveralls be used for any other purpose other than as a protective workwear? A: While the manufacturer intends to avail garments that help workers stay safe at work, some people opt to use coveralls otherwise. For instance, some people choose to use them as improvised costumes during events such as Halloween among other fun occasions. When talking about coveralls and work uniforms, the narrative is significantly different as they are unrelated to regular clothing. As you may have realized, numerous factors come into play when deciding the perfect garment for distinct roles. Since you are more familiar with the job for which the coverall is being sought, you will be in a better position to tell what would be the best pick. By taking into consideration comfort, design, quality of fabric, and durability, it becomes a lot easier to narrow down and select the purchase. Although what you may be willing to spend also matters, it is advisable you let the features of the product guide you when making the decision. The most important aspect of it all is to stay safe.